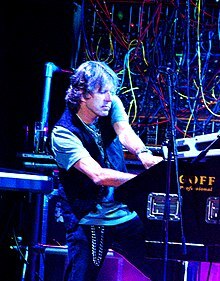 Keith Noel Emerson (2 November 1944 – 10 March 2016) was an English keyboardist and composer. Emerson played in a number of bands before he found his first commercial success with P. P. Arnold's backing band the Nice in the late 1960s. Emerson was born in Todmoreden, West Riding of Yorkshire. He was a founding member of Emerson, Lake & Palmer (ELP) in 1970. Emerson, Lake & Palmer were successful through much of the 1970s. They became one of the best-known progressive rock groups of the era. Emerson committed suicide by shooting himself in the head at his Santa Monica, California home. He was aged 71. Lupis, Giuseppe (May 2006). The Published Music of Keith Emerson: Expanding the Solo Piano Repertoire (D.M.A.). University of Georgia. OCLC 223323019. Retrieved 7 January 2015. Pethel, Blair (1988). Keith Emerson: The Emergence and Growth of Style: A Study of Selected Works (D.M.A.). Peabody Conservatory of Music. OCLC 37599731. ↑ "VH1.com: Keith Emerson: Biography". Retrieved 23 February 2012. ↑ Nilsson, Anton. "British music star Keith Emerson dies aged 71 from reported suicide | Daily Mail Online". Dailymail.co.uk. Retrieved 12 March 2016. ↑ Rawlinson, Kevin; agencies (2016-03-11). "Keith Emerson of Emerson, Lake and Palmer found dead aged 71". The Guardian. ISSN 0261-3077. Retrieved 2016-03-12.